I think it's official. I crochet. My current knitting project is a big and wonderful sweater, but a bit too bulky for carting around here and there and everywhere. All the places I go. But oh, a granny square? Well, that's quite portable. And so I find myself with it in my hands all the time, even on the side of the nordic ski course. Nordic skiing being one of the most ridiculous spectator sports in my opinion, however wonderful it may be for the racer! But watching? Standing still in very cold temperatures for hours while not really even seeing much of the skier? Hmn. It could use some improvement, the watching of said sport, which can be achieved with just a hook and some yarn. At least my fingers were moving and staying warm(ish). I knit these squares not really having any kind of plan for them - the yarn is a lot of my early handspun and dyed (koolaid made that pink! ), so it's not terribly consistent, but fun in color and feel regardless. The trouble with that no-plan strategy is that I ran out of a yarn before I could even reach a finished something or other. But oh, the internet is a treasure trove of granny square solutions! And so, with most of this yarn now gone, I think a pillow cover this shall be, at 20" square, thanks to a healthy bit of blocking by the fire last night. And then I can start plotting the next project, which just might have a plan this time. Or maybe not. There's something quite nice these days about one foot in front of the other, one step at a time, one crocheted square of yarn in a sitting. Wishing you all a most wonderful start to your week! Greetings from Around the World Stories! Around the World Stories creates fun, original audio stories about other countries and cultures for kids ages 5-12. Each 30-minute story focuses on the adventures of a child from another country. Kids will learn how other children in the world live, play, learn, eat and speak - all from the perspective of a child. The stories can be downloaded or streamed, and each one comes with a parent guide full of discussion topics, background information, recipes and activity ideas to further enrich the experience. Follow Around the World Stories on Facebook, Instagram and Pinterest. Tania: It's always been important to us that our kids develop a global perspective. We searched for something that we could use to help them learn about other cultures, something fun and memorable that would inspire them to learn about our amazing world. But nothing really felt right for us. So with a love of storytelling and a longing to teach children about the beauty of our world’s diverse cultures, we took a leap of faith and created Around the World Stories. Last summer, my husband left his job, we sold nearly everything we owned and started Around the World Stories. Along with our our three daughters (plus our sweet Labradoodle) we began our one-year adventure to travel around Europe while writing stories based on the places we go and the people we meet. We believe that stories are powerful teaching tools, and we’ve always made them a big part of our learning and our lives. Good stories not only entertain, but also teach and inspire. That’s why storytelling is a perfect way to introduce children to the world, while instilling compassion, understanding and kindness. Not everyone can and not everyone wants to travel abroad, but we feel that learning about other cultures is important as we all strive to raise compassionate, caring and tolerant children. We are so excited to be sharing stories about other traditions, foods, customs and ways of life. Creating Around the World Stories and watching it grow has become such a great joy in our lives - more than we ever imagined. The Full Story Pack has all the stories so far released (35) in addition to one new story each week until the story library reaches all 52 stories about Europe. Each story also comes with a parent guide with discussion points, country information, recipes and activity ideas. In addition, Around the World Stories would like to offer all SouleMama readers $20 off the Full Story Pack using the code SOULEMAMA20 or a one-month free trial of the Story-a-Week subscription using SOULEMAMA1. Both coupons are valid until February 12, 2017. These audio stories sound absolutely fabulous and even more that they include more than just the audio with recipes and other fun things from each country!! Woolen Moss is a small custom organic clothing shop in upstate New York. We believe in comfort, beauty, and freedom of movement, and we think you’ll get that from from any garment you find here. You’ll find a variety of certified organic cotton and bamboo garments, as well as our specialty, merino wool clothing. Right now I have some lovely light weight merino jersey that drapes beautifully and adds a light weight layer to help keep you warm. I also have a brand new set of colors in a heavy weight merino: camel, mocha, and midnight (black), that is insanely thick and soft and will take the cold out of any winter day. Take a look around and enjoy! Find shop updates, sales, and general musings on the Instagram @woolenmoss. Kate: It’s all in the stitches. Those of you that are familiar with my work, know that each piece comes with a decorative hem that says, “This garment is different. This garment was made BY someone, FOR someone.” Aside from the comfort, it’s one of my favorite things about wearing these clothes. And I’m starting to bring it into more aspects of the work. The Moonbeam Skirt is one of my favorite ways to display that detail. But this week I’ve introduced the Moonbeam Sweater and the Moonbeam Dress, each available in the light weight merino jersey and also the heavy weight merino sweater knit. (please feel free to inquire about these designs in organic cotton if wool doesn’t work for you). my most popular item in the shop, plain and simple... a pair of merino wool leggings. The light weight version offers a great layer for under your pants, skirts or dresses, where the heavy weight version stands alone, even on the coldest of days. Additionally, I’d like to offer 15% off through next weekend, February 5th, using coupon code #PINKHAT at check out. Now’s not the time to be apolitical, it’s the time to stand tall, be loud, be heard, make a statement, use your voice. I make clothing, but I’m also trying to make a difference. You can too! she has such beautiful clothing!! There is so much on my desk right now - and even on my needles - that I just can't tell you about yet! Because there are some really great and fun things in the works for this coming year. I'm excited to share them all with you when the time is right. Soon! Until then, know that I'm busily working away on some good things when I'm a little bit quiet in this space. There is that nearly done sweater though that I CAN talk about. I'm very happy to be casting off for that soon - maybe even today if the knitting stars align for me. It's Mountain High and I am so in love with it so far (I've stopped to try it on more times than really is necessary for proper fitting). As love as I am with the sweater, and the yarn (ours! ), I will be happy to be done with the gray. It is late January after all, and with a whole lot of ice and gray skies outside our window, I could use an infusion of color. It might not help that I'm currently reading Lincoln's Melancholy: How Depression Challenged a President and Fueled His Greatness - a fascinating book, but perhaps not the best tone for such a time of year in Maine (especially after I add my daily newspaper reading). I think it might be time to set that particular book aside until the green grass appears, and opt for a happy, fantastical fairy tale instead. Yes, that's that. I've just decided that when this sweater is off the needles, I shall knit something colorful. February needs a rainbow! I am catching my breath now from the weekend. What a weekend, wasn't it? So moving and inspiring and just the right start to what comes next. I'm diving in and getting to work. Maybe I'll see you out there. We capped a full weekend with a celebratory vibe, as Calvin turned 16 yesterday. I do not know how it is that my baby is sixteen years old, but here we are and there he is. A tall, strong, smart, funny, sensitive and thoughtful young man with the whole wide world ahead of him. What an absolute joy it is to watch this all unfold. A snow day was called today, canceling everything we had planned, even skiing! Because it's really not snow, but rather ice. An ice storm is no fun at all, at least not on the outside. But inside....well, we can do inside just fine. The living room floor is already littered with paper and it's only ten in the morning. I predict lots of art being made today, more than a few chess games played, and some music too. It'll be soup for dinner. Nothing extraordinary except the wonder and beauty of everyday, and all of us here enjoying it together. I'll take it (and count my lucky stars). I've been thinking back a lot, like many of us surely, to 2008. A much younger crew of three kiddos were in our family at the time of the election, at such impressionable and important ages. Heck, I was younger and more impressionable! We talked so much about what was happening then on the political stage (as we do now), and the way Steve and I were moved was reflected in the kids as well. Ezra, deep in a love for studying all presidents at the time, dressed himself as a campaigning Barack Obama for Halloween. Calvin, deep into sports, treated sign making like a baseball game, with Go Obama Go signs littering nearly every tree in our backyard trail (only a little bit missing the point that no voters would be in those woods). A whole other lifetime ago, it feels. And eight years later, I have so much gratitude for the work that's been done to better our world in the time that has passed. And then we return home and continue the talking and continue the work that lies ahead. Like so many others I know, I've been feeling sad and overwhelmed as I read the news each morning and wonder what is coming next, and what I can possibly do about any of it. Least of all, how to explain this to our children, how to protect them and their more vulnerable family members and peers, how to empower them to take action themselves. It seems fitting then, that this week I found great comfort and strength in the words of Obama himself. And I hope you don't mind that I share with you the answer to one of the questions he received at his last press conference. Whether you agree with me about the good this man has done or not, I do believe his words about being a parent are universally true. These words moved me so much when I heard them that I quickly printed them out as inspiration and motivation. Because I, too, have great hope in people. CHRISTIE PARSONS, of the LA Times: The first lady put the stakes of the 2016 election in very personal terms, in a speech that resonated across the country. And she really spoke the concerns of a lot women, LGBT, people of color, many others. And — so I wonder now, how you and the first lady on talking to your daughters about the meaning of this election and how you interpret it for yourself and for them? OBAMA: You know, every parent brags on their daughters or their sons. You know, if your mom and dad don’t brag on you, you know you got problems. But man, my daughters are something. And — and they just surprise and enchant and impress me more and more every single day as they grow up. And, so these days when we talk, we talk as parent to child, but also we learn from them. And, I think it was really interesting to see how Malia and Sasha reacted. They were disappointed. They paid attention to what their mom said during the campaign and believed it because it’s consistent with what we have tried to teach them in our household and what I’ve tried to model as a father with their mom and what we’ve asked them to expect from future boyfriends or spouses. But what we’ve also tried to teach them is resilience and we’ve tried to teach them hope and that the only thing that is the end of the world is the end of the world. And so, you get knocked down, you get up, brush yourself off and you get back to work. And that tended to be their attitude. I think neither of them intend to pursue a future of politics and in that, too, I think their mother’s influence shows. But, both of them have grown up in an environment where I think they could not help, but be patriotic to love this country deeply, to see that it’s flawed, but see that they have responsibilities to fix it. And that they need to be active citizens. And they have to be in a position to talk to their friends and their teachers and their future co-workers in ways that try to shed some light as opposed to just generate a lot of sound and fury. And I expect that’s what they’re going to do. They do not — they don’t mope. And — and what I really am proud of them, but what makes me proudest about them, is that they also don’t get cynical about it. They — they have not assumed because their side didn’t win or because some of the values that they care about don’t seem as if they were vindicated that automatically America has somehow rejected them or rejected their values. I don’t think they feel that way. I think they have in part through osmosis, in part through dinner time conversations appreciated the fact that this is a big complicated country and democracy is messy, it doesn’t always work exactly the way you might want. It doesn’t guarantee certain outcomes. But if you — if you’re engaged and you’re involved, then there are a lot more good people than bad in this country and there’s a core decency to this country and — that they got to be a part of lifting that up. And I expect they will be. And in that sense, they are representative of this generation that makes me really optimistic. I’ve been asked — I had — I’ve had some off-the-cuff conversations with some journalists where they said, “OK, you seem like you’re OK, but really, what are you really thinking?” And I’ve said, “No, what I’m saying really is what I think.” I — I believe in this country. I believe in the American people. I believe that people are more good than bad. I believe tragic things happen. I think there’s evil in the world, but I think at the end of the day, if we work hard and if we’re true to those things in us that feel true and feel right, that the world gets a little better each time. That’s what this presidency has tried to be about. And I see that in the young people I’ve worked with. I couldn’t be prouder of them. And with that...out the door I go. I'll see you out there! Power to the People, my friends! I've often worried aloud (only a little bit seriously) about what will become of me when the kids leave. Not only do I have no idea how to cook for just two people anymore, but truly the schedule and rhythm of the kids is what keeps me on my own good rhythm of productivity and flow. I fear that left to my own devices I would quickly spiral down into a not very civilized version of myself. One that stays in her pajamas all day, works from bed, and eats easy, mostly already prepared food directly from their containers. I do so love cozy. Judging by how my first "Ski Day" at home alone went, I have good reason to be worried. I mean, yes, I did get a great deal of work done, quite blissfully by the fire (a place rarely so crowded during the day that it's not good for quiet work). I also managed to take frequent breaks to stretch and somehow deal with every piece of laundry in the house (a huge task, I'm sure you can imagine). I managed some photographs of things that needed photographing (and speaking of - all remaining Taproot Pop Up Goods are now on sale! Plus the 2017 Calendar!). I also had a photo shoot go quite awry, complete with it ending in me locking myself out of the house (in my pajamas, as I said). But I also got a little bit lonely not very far into the day. Greta had no interest in hanging out with me, and there wasn't a cat to be found. The sheep were only interested in what was in my pockets. And so I found myself happily entertained taking videos of a goat chewing. Yes, it came to that. The only food I managed to eat all day was a chocolate bar (holy cacoa, indeed! ), goat cheese and crackers (none of which made their way onto a plate), and lots of tea. Even my knitting project was stalled, as I can't remember what size needle I used for one sleeve and dare not cast on for the other without that knowledge. All in all, I'd say I've got some practicing to do on this alone thing. Thankfully though, I've got some time. Everyone came home, absolutely hungry (there was chili on the stove), ready for cozy (the fire was roaring and the house clean), and eager to tell tales and snuggle (I was open ears and arms). But my camera, thank goodness, always serves as a reminder of the underlying current of how our time is spent. Nearby enough that I can reach for it throughout the day, and later reflect on the moments that for one reason or another, made me pause to record what is happening. This weekend, that was all about connection....and light. The children, as you can see, are following the light all around the house, and the warmth too. Literally, this is absolutely the case - we are all drawn to it this time of year, craving it and soaking it all in like the best of cats. We start the morning with the sun in the library, then follow it to the other side of the house, landing us all as close to the fire as possible by evening. And in our hearts this is the truth as well, as I'm realizing we are drawing closer to friends right now, closer to connections, closer to the light and warmth that we all so need and want. This weekend, Kirsten Rickert (creative Mama and frequent contributor to Taproot) and I gathered for some creative work and play, and it was a true delight and wonderful comfort. A few old friends came and went as the weekend progressed as well. Each time, gathering by the fire, we worked with our hands, and talked through the troubles and joys of our lives and the lives of those around us in the wider world. We didn't solve any of the problems of the world, that's for sure, but we certainly did listen to each other. We offer solace, love and light where we can. And hopefully from that, some ideas for action in small and large ways. I do not know where I'm going with this, which is a little bit how I'm feeling these days - and I know I'm not alone in that sense. The time of year, the time of our parenting lives, the time of our global world - so much is changing at home and beyond. But I do know that warmth and connection is what I'm craving and nurturing right now. And that I'll keep following that sun through my home and in the world just as long as it keeps shining. Do you sometimes feel at a loss in your role as parent? That you aren't sure how to respond to some of your child's behavior? Do you grow impatient or angry more often than you'd like? Do you sometimes feel like your child sees you as his or her opponent? I get it. Do you wish you had a better approach for the challenging moments of parenting? Do you yearn for a closer relationship with your child? Would you like your child to know that you are her "best bet"? That you are the one who will tenderly hold his or her heart? I get it. As parents, we have so much love for our children; we want only the best for them. But sometimes, daily behaviors and patterns of interaction feel complicated; we don't know how to respond to rude or aggressive behavior; we find ourselves triggered and saying things we never thought we’d say; we find ourselves engaged in power struggles, arguments or endless iterations of consequences. I get it. In Discipline: A New Paradigm, which is based on the attachment-based developmental theory of Dr. Gordon Neufeld, we will start at the beginning: with our relationship with our child. We will come to understand that our connection with them is the root of their growth, happiness, maturity and development. We will learn how to make sense of our child's behavior (and misbehavior!) and how to preserve our relationship with them, no matter what comes our way. Warm, firm, calm, kind and generous: This is the new paradigm. Won’t you align your parenting with your heart this year? Join me. Follow Handmade Parenting on Instagram and Facebook. Lisa: I am thrilled to be adding a new online class to Handmade Parenting’s roster of online offerings; Discipline: A New Paradigm will launch on 1/30! I have spent the last few months translating the rich content from my popular in-person Discipline classes to a warm online format. The online class website is incredibly user-friendly and easy to navigate; the content is a balanced combination of work-at-your-own-pace videos (watch them during nap time/on your phone during your train commute/at the gym etc. ), a vibrant parent forum for connecting and sharing, and Saturday morning live group coaching calls. I hope you will join me! When you sign up for Discipline: A New Paradigm between 1/14-1/18 with the code SOULEMAMA, you will receive a lovely Cozy Study Kit delivered to your doorstep! The Cozy Study Kit includes many delightful items from small businesses I love including: a hand thrown mug from Of Hand Studios, small batch truffles from Missionary Chocolates, handcrafted tea from Tea Chai Te, a washcloth from Rough Linen, my favorite parenting book & more. Obviously, the true “bonus” of signing up for the class is the deep connection you will experience: both to your child and to your parenting intuition, but the cozy study kit is a nice little “extra”! As anticipated and as we've talked about at least every couple of days for the past year, Annabel joined the Soule Family Skiers this year (five is the magic age in our house). That photo above is what Steve sent me of her, on her way to her first run of the tiny "magic carpet" (he also wanted me to know that he adjusted her helmet properly after this - she was so squirrelly to get up there that it took a little bit of chasing - while wrangling three other kids - to get her to hold still long enough for it). As we expected, she loved every second of her day (as evidenced by the crumbly mess of exhaustion that showed up at the end of the day, ready to crash into bed!). The kids say she was making great turns, was brave but not risky, and happy to be there and out in the elements all day, despite it being exceptionally cold. Its official - she's in! She had many stories to tell me the next day, once recovered from exhaustion, mostly about how she was THE FASTEST person on the mountain. The whole mountain. The FASTEST. (I didn't know that was a goal.) Later in the day, while I was making dinner, I heard her fishing around in my studio mumbling to herself. I intended to check in - sometimes things go missing from my studio for all kinds of crazy reasons and often that's not a good thing (nothing like searching for your pinking shears only to find out they've been absconded to the barn and used for duct tape). But dinner distracted me and I forgot all about it until this morning, when I noticed a pile of fabric next to Annabel's bed. "What's going on with this?" I asked. "Oh," she said "those are going to be my dresses." Because, it turns out, if you are now a skier on ski Tuesday, that doesn't mean that Tuesday dresses are a thing of the past. It just means that you sew them on a different day of the week. That's what she told me, anyway. And well, how could I argue with that? My machines are a bit dusty (literally), as is my sewing. It seems ages since I've sewn more than a curtain hem, or put a quick patch on someone's pants. It can't have been that long, but it does feel that way. I'm glad for the push from her, though....it'll be nice to sew today. My blog, Homestead Honey, is a space for inspiration, resources, and connection. I share and celebrate the joys and challenges of our off-grid homesteading, homeschooling life in hopes that others might be inspired to live their own homestead dream. My current offering, Gather & Glean Homestead Mentorship Circle is 10-week group coaching and mentorship program for women who are passionate about homesteading and community. In Gather & Glean, we come together as circle of radical homesteading women who are similarly motivated to achieve our dreams and glean wisdom from one another’s experience. The next Gather & Glean Circle begins on January 16, a perfect time to get clarity around your values and vision, and to set powerful intentions and take inspired action on your goals and dreams in the New Year! Sign up for my weekly eNewsletter, full of seasonal homesteading tips and inspiration. Hello! I'm Teri, a mama to two, Ella (9) and Everett (6), and wife of Brian, an artist blacksmith. My blog, Homestead Honey began about five years ago as a journal-style blog, sharing family and homestead life with two young children. In 2012, our family packed up our Oregon homestead of 13 years and moved onto raw land in NE Missouri to create an off the grid homestead from scratch. The process of detailing the creation of our homestead transformed the blog into a central part of my online business. I have since written several eBooks, Creating Your Off-Grid Homestead and The Backyard Bread and Pizza Oven (a collaboration with my husband), and co-created The Homestead Kitchen eCourse. I'm also a life coach and work closely with women who want to create a life that is closely aligned with their vision and values. 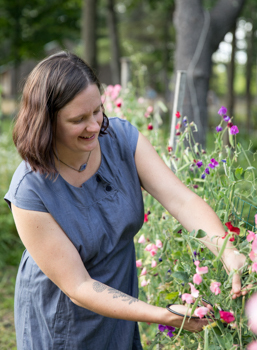 I'm passionate about homesteading, Waldorf-inspired homeschooling, gardening, and creative entrepreneurship, and love helping others grow their own homesteads, produce more food for their family, and create businesses that they love. My latest offering is a small group coaching program for women who are passionate about homesteading and community: Gather & Glean Homestead Mentorship Circle. By creating a deep virtual community, Gather & Glean provides support, structure, and weekly motivation to help women take huge leaps forward in their homestead dreams. It's pretty magical to come together in this circle of women and see the transformations that occur! In addition, SouleMama readers are invited to enter the Special Offer Code "SOULEMAMA" at checkout for a free 45 minute one-on-one coaching session (a $50 value) when you enroll in Gather & Glean. Registration ends on January 16. Greetings from Mindful Clutter Clearing! The Mindful Clutter Clearing e-course is a 7-week journey to a more spacious, peaceful, and intentional home. Begin your new year on a positive note by clearing away the clutter from your home and life, and make room for what really matters to you. With seven weeks of mindful guidance, inspiring podcasts, guest interviews, and take-action homework assignments, we will work together to gain more space in our homes, and face the year ahead with renewed energy and purpose. Clutter clearing is work that is both emotional and physical in nature, and in this course we address both pieces equally, with gentle encouragement. By teasing out the meaning of the complex emotions at the root of clutter, you may suddenly find yourself able to let go of items you have been holding onto for years (or decades! ); and by learning to break down a seemingly overwhelming task into doable bite-size pieces, you can begin to make strides in clearing your space with confidence instead of fear. Think of this course as your personal guide, walking you through simple steps that add up to great changes in your home and life. Along with the class, you will receive a printable PDF course workbook and journal; lifetime membership in the private (and completely optional) Mindful Clutter Clearing Facebook group; and a downloadable e-book packed with all of the lessons and assignments covered in class. The course is given in "real time", meaning the lessons and podcasts will be tailored to our group, and I will be available to answer questions throughout the course. Laura: Thanks to wonderful feedback from former students, I have decided to make this session of Mindful Clutter Clearing the longest yet, at seven weeks. This extra time will allow for more breathing space to dig deeply into the lessons, as well as a week devoted to facing (and surmounting!) common stumbling blocks on the road to a clutter-free space, including the fear of finishing, the trap of perfectionism in a Pinterest-perfect culture, and our resistance to accepting help when we need it. One spot in the upcoming Mindful Clutter Clearing e-course, which begins January 16. In addition, SouleMama readers can use the code SOULE17 at checkout to receive 10% off enrollment in Mindful Clutter Clearing. Discount ends 1/15/17. Removing clutter is a good thing. I would be so grateful to win this, I could soooo use it! This sounds like a great course, and wonderful business, thank you! I do so love the holiday crafting that happens in the last months of the year. It's exciting and fun, thinking about the person we're crafting for, and being caught up in the flurry and good energy of the elving season. But after that, January crafting might just be my favorite of all. The clearing of the slate that comes with a new year makes way for so much, both in the trying of new things, and in the finishing of old ones. Invariably, in the month of January, I finish so many unfinished things that have been languishing for ages. And when it's stormy and cold outside, there's really nothing better. My eyes are beginning to turn to piles of yarn and fabric everywhere, scheming and dreaming up what could be done. And my hands are full - motivated to finish old projects (so close to the finish line on my Mountain High sweater that I am loving so much! ), and excited to play around with something new. Many of you asked about where I got my crochet instruction and I wanted to tell you that I watched the beginner videos by Cal Patch on Creativebug (borrowing Adelaide's subscription there, because my girl LOVES those video tutorials!). I was watching on my phone one evening this week next to Ezra on the coach, engrossed in his own thing. "Wow!" he looked up. "I know, right?" I replied. Because it's true, Cal has the most amazing teaching voice ever, so patient and mellow, you believe you can do anything. Like crochet a granny square. There's more stormy weather coming, or at least cold weather that makes outside play less fun. I think I'll be playing with yarn. And you? Has the January crafting bug hit? Well, would you look at that! This Mama's first crochet, and corresponding wonky first granny squares! It just goes to show. You never know what wild and crazy surprises a new year has in store! I woke up this morning, the first Monday of a new year, ready to go - with a hefty to-do list backed by the rest of holiday time, and the energy of a new year. But something stopped me from getting right to it when I entered my studio this morning and I'm so glad I listened and paused, and stopped to remember. A browse through the photos of 2016 felt like the most important thing to do and that's just what I did, a few from each month here. What a year it was! Full of so very much! There was a great deal of travel, certainly more than I've ever done in one year. There were solo trips with some of my kids, with memories that I know will last a lifetime. Steve took some too, and has his own stories to tell. There were so many firsts - first plane rides, first prom, first drivers test, first summer camp (and the corresponding first lice! that was fun! ), and so much more. Our weekends were full of theatre, skiing, circus arts, piano, fiddle, ballet, running, and oh my gosh, so many things. We put a whole lot of miles on our van. My children fought a whole lot. But they also loved each other a whole lot too. And good gracious, did they grow! And I think I did too. In my marriage, as a mother, and in the healing of my body. I greeted 40! I made new friends, and deepened old friendships. I fell deeper in love with my work. But more than all the firsts and the extraordinary moments that fill us up with memories and stories, I remember and honor the everyday ones, too. Our garden that grew even more this year, the animals we cared for and loved (and helped birth), the gazillion games of chess and Monopoly and Sorry. The many moments in front of the fire playing music together. Our conversations on long car rides. The many handknits that landed on their bodies. And so much more. So much fits into a day in the life of a family....and that's a whole lot in one year. And in this year, this blog of mine turned eleven. It was an entirely different world eleven years ago, as I know you know. This now "ancient" method of communicating was new and fresh in 2005. I was a young (!) mother of two (!). The time I was able to put into this space was much more than it is now. But I can't tell you what it means that you're still here or that you've just found your way here and have decided to stick around. That this space is still, each day, an open window through which we can connect gives me such hope and good feeling about the world when the daily news can sometimes convince me otherwise. Because I know for certain that one thing we need is more connection to one another. Each of us, living our own full and very different lives, have so much in common when it all comes down to it. We are united in our journeys. From my family to yours, and from my heart to yours, I am wishing us all a very happy, healthy, gentle and kind 2017!